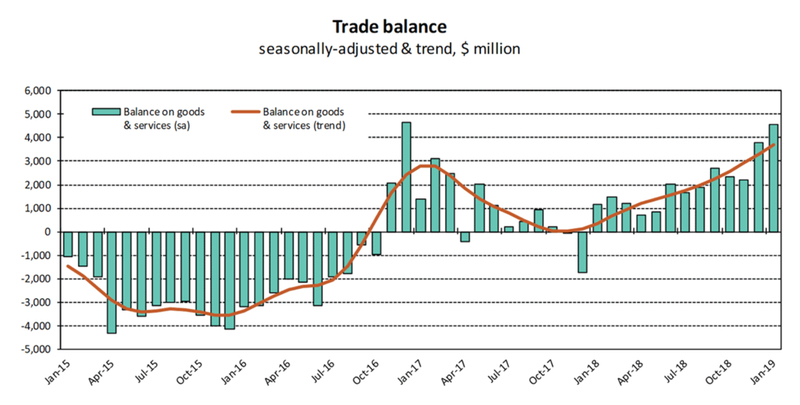 Since 2016 the Australian exports have exceeded imports, creating a positive trade balance of $4,000 million. Is that an indication that Australia has diversified in trading to compensate for its large dependence on commodity exports to China? The largest share of exports was for China, which accounted for $123 million or 31% of total exports. Most of the value added of these goods were raw materials, which are commodity goods. The current Australian net surplus from trade amounts to only 5% of total trade which shows how dependent are the Australians on the China trade. Balancing exports are imported goods, with China merchandise representing the largest share of 18%, or $71 million. Whether the difference in this trade is profitable is not known. It is a matter of a difference in the prices of materials (e.g. a commodity) vs. manufactured goods from China whether on a net basis China trade makes a profit. Imports from China for 2017-18 were $71 million, thus creating a $52 million positive balance. If the imports are most likely consumer and information technology items where the trade are likely to be profitable. On the balance the China trade will depend on the price that the Chinese will pay for raw materials. 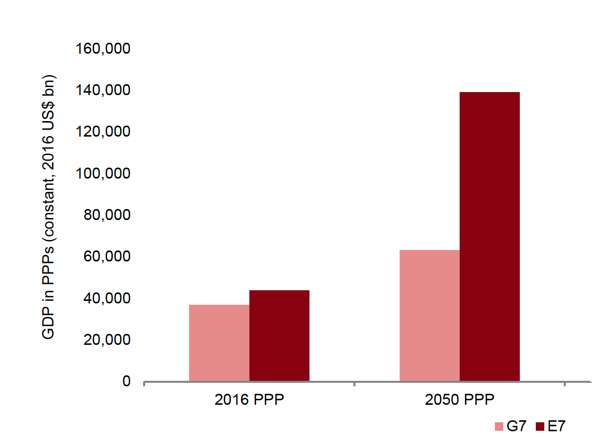 How long can a favorable balance of trade with China last by 2030? China's annual growth in GDP during 2016-2020 is directly related to China's importance as a trading partner. While China is advancing at a 6% annual GDP growth there was a continuous demand for materials which are readily available from Australia. Will the current positive trade balances persist through 2030 as future China demands for raw materials needs are likely to decline? That will depend on the competitiveness of Australian's materials. China is likely to find cheaper sources or raw material commodities as newly explored areas are found, such as in Africa. In the near future developed countries, such as the US and Europe, will be able to maintain relatively high levels of income per capita as well as continued relative prosperity. However, the relative decline in the population of G7 countries will result in shift to E7 countries where the growth and GDP will be found. Australia that culturally has always been a part of G7 may now have to diversify to take advantage of E7 opportunities.